Every month, MAC sends out invites to leadership and spouses on Fort Riley regarding the monthly breakfast, generally held every 4th Thursday of the month. If you are leadership or a spouse and not receiving these emails and would like to, please send your information to SEAN@JCACC.ORG. Once you send in your information, you will be added to the contact list and will begin to receive notifications. We hope to hear from you! The MAC conducts a monthly breakfast at 7:30 am on the fourth Thursday of each month (except November and December). The MAC breakfast brings together business, civic, retired military, and military leaders in a social setting where friendships develop and mutual issues are discussed. 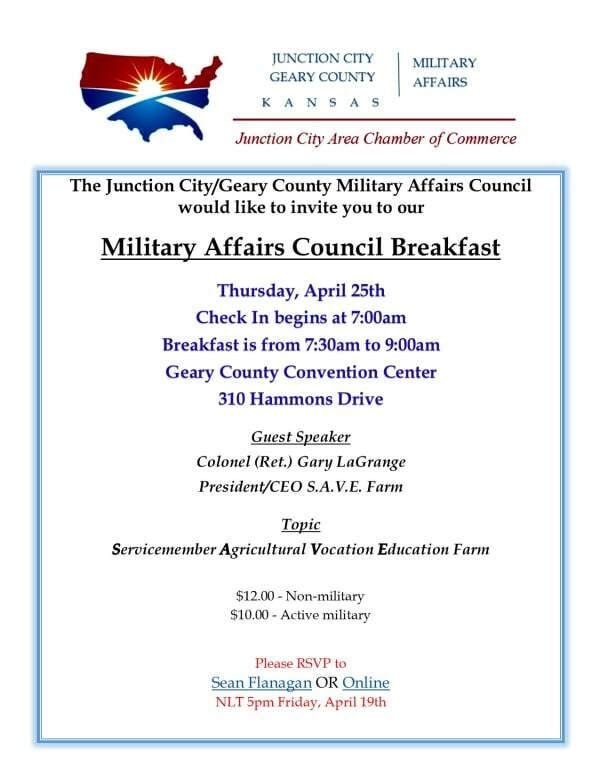 A guest speaker, both civic and military, is a part of the breakfast. Chamber members and other guests pay $12 for the event. Military service members pay $10. As always, reservations are important. The deadline to register is the Friday before each MAC Breakfast by 5pm. 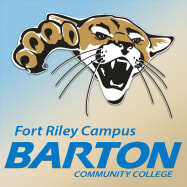 To make a reservation, please register online or contact the JC Chamber by email sean@jcacc.org or call 785-762-1976. If you wish to be invoiced, please make sure we have your email. Every month the Military Affairs Council will raffle off a Barn Quilt at the MAC Breakfasts. Half of the proceeds will go to a military / veteran organization (will vary monthly) and the other half will go a scholarship fund for students at the Junction City High School. 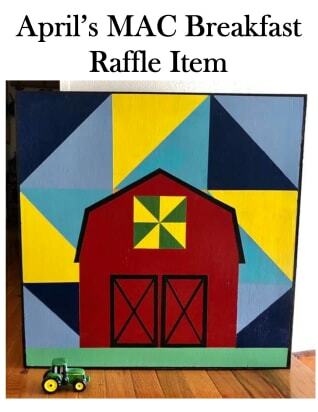 Tickets for the Barn Quilt raffle can be purchased at the Chamber or at the MAC Breakfast.